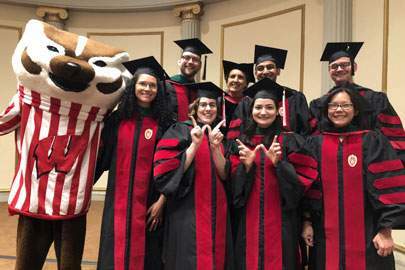 The University of Wisconsin-Madison Medical Scientist Training Program (MSTP) typically takes between seven and eight years to complete, with flexibility based on an individual’s PhD research and dissertation timeline. 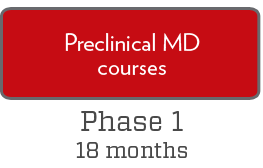 Our MD-PhD program is fully integrated with both clinical and research elements throughout the entire program, including weekly seminars, journal clubs and other MSTP-specific course and events. Students in the Medical Scientist Training Program will participate in a weekly one-credit journal club during the first two years of medical school. The first semester course during Phase 1 is led by Director Anna Huttenlocher and focuses on evaluation of research articles in the New England Journal of Medicine's "Clinical Implications of Basic Research" series. 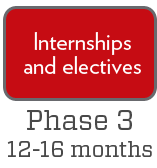 It serves to acquaint students with each other's interests, initiate discussions of research opportunities at UW-Madison and pay attention to ethical and computational issues raised by research articles. The second semester journal club is led by Associate Director Mark Burkard and concentrates on cell signaling and its relevance to human disease and cancer biology, with activities related to grant writing and a mock study section. The second-year (third journal club) is led by Associate Director Caitlin Pepperell and some of the objectives of this journal club are to understand recent advances in the generation and analysis of large-scale datasets in biological and medical applications, and to identify ethical complexities involved in collecting and analyzing genomic data. Students in the Medical Scientist Training Program will participate in at least three research rotations in laboratories of their choice. These three- to four-week rotations are done in the summer of Phase 1. 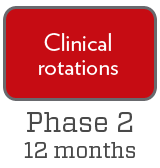 In the event a lab is not selected after three rotations, an additional rotation can be taken the summer after Phase 2. In order to maintain and expand upon the clinical skills learned during the first two and a half years of medical school, students in the Medical Scientist Training Program participate in Medicine 903: MSTP Longitudinal Clinical Clerkship in Graduate School during their graduate training. 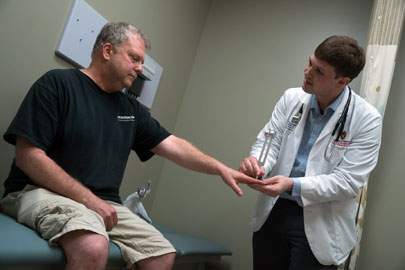 Students choose a faculty mentor and work one-on-one in the clinic for a total of 40 hours throughout the course of the semester. The recommended format is 10 half-day clinic sessions, but can be distributed differently. Students see patients exactly like a Phase 3 medical student and discuss a number of academic articles with their mentor. Students will be required to complete three semesters of this course (one credit per semester), with the option of completing an additional one to three semesters for a total of up to six credits. Added to the MSTP curriculum in 2014, this course replaces the required traditional Phase 3 preceptorship that is required for regular MD students. The purpose of Medicine 902 is to provide an opportunity for students to develop an understanding of how to conduct clinical research through an apprenticeship-style learning experience with a physician-scientist mentor. Throughout the course, students connect their research to the public health needs of the community and state of Wisconsin. 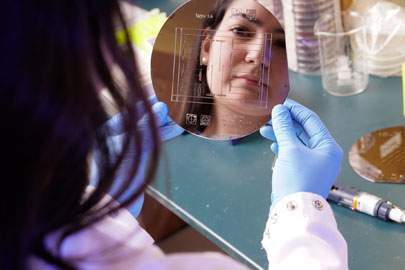 They also learn about the regulatory process through attending Institutional Review Board and Scientific Review Committee meetings, integrate clinical experience with research, and experience other facets of a career as a physician-scientist.